What's New @ Roselle Public Library: Net Neutrality - Should you care? Net Neutrality - Should you care? We've been hearing a lot in the news about net neutrality. FCC commissioners will vote whether to eliminate it or not on December 14. Does their decision affect you? Should you be concerned? If you use the Internet - and who doesn't these days - it does affect you. Net neutrality is the principle that internet service providers (ISPs) must enable access to all content and applications regardless of the source and without favoring or blocking specific services or websites. If net neutrality is eliminated, ISPs will be allowed to provide faster connections to websites and services that pay a premium, or prefer their own business partners when delivering content. 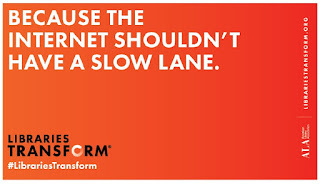 Essentially, eliminating net neutrality creates a "slow lane" for Internet users. Read the American Library Association's explanation of net neutrality.